After a long year we return to Dublin this week (only for a short time unfortunately). Most people think they have a general idea of what to expect when they’re going to Dublin. The first things that come to mind are Guinness, pubs, maybe a few castles. Yes, Dublin's got all of that, but there’s so much more. I believe it is good to visit this city and do certain touristy things and a good chunk of things that most tourists don’t do—but should. Today, I’m excited to share with you a those places I think you shouldn’t miss, as well as some off-the-beaten-track spots that will give you a feel for the real Ireland. The recession have been tough on the Irish, but made Ireland a much more affordable place to visit – prices have gone down, and value has gone up all around. You can find cheap deals on hotels and restaurants. You'll also find a great deal artisan products and shops. The Guinness Factory will walk you through the process of making Guinness.At the end of the exhibition you get to taste the freshest Guinness in the world in the Gravity Bar. Even if you aren’t a fan of Guinness, the Gravity Bar provides the best view of Dublin. Now used for state receptions and presidential inaugurations, Dublin Castle is another wealth of information about Ireland’s and Dublin’s history. With rotating exhibits, as well as State apartments, chapel and heritage center, it’s a crash course in Irish history. You enter Trinity College through stately wrought iron fence giant stone entryway gate and a massive wooden door. It’s really breathtaking. Trinity College houses the Book of Kells, but you really shouldn’t miss the historic Long Room Library, two stories of floor to ceiling bookcases housing some of the oldest volumes in the country. St. Patrick’s Cathedral is an imposing, grand building that just begs for you to come inside. The gardens are beautifully manicured, and the enormous stained glass windows are awe-inspiring. The building dates from 1220 and is still used for weekly worship and many local college graduations. Phoenix Park is situated in the center of Dublin, and has a whole range of activities for visitors to check out. You can rent bikes to explore the almost 1,800 acres, and stop at the recently updated Dublin Zoo, see the herds of wild deer, or foxes, hedgehogs, rabbits, pygmy shrew, house mice, wood mice and brown rats which are also park in habitats. The Irish President’s residence, Uras an Urachtarain. The only ambassador to Ireland whose residence is inside the park is the American ambassador – and the residence was modeled after the White House. Proof of the special relationship between the two countries. In addition to the range of artworks housed here, I like it for the cafe – lovely coffees and hot chocolate – perfect if it’s a little chilly out!i also love the shop it has beautiful prints and a perfect kids section. There are also a lot of kids programmes and free crayons clipboard and paper at reception for all those little artists. The National Museum of Ireland - Archaeology is the national repository for all archaeological objects found in Ireland and home to over two million artifacts. The National History Museum is a neat spot to visit, especially if you’ve got kids in tow. Dubliners refer to it as the Dead Zoo, the National History Museum has taxidermy animals from all over Ireland as well as around the world. These are my very fave places in the city. They provide a perfect spot for mini breaks in the city. 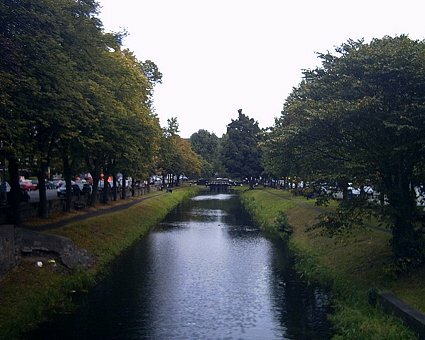 The park is adjacent to one of Dublin's main shopping streets, Grafton Street, and to a shopping centre named for it, while on its surrounding streets are the offices of a number of public bodies and the city terminus of one of Dublin's Luas tram lines. It is often informally called Stephen's Green. At 22 acres (89,000 m2), it is the largest of the parks in Dublin's main Georgian squares. St. Stephen's Green was enclosed in 1664. The 9 hectare(22 acre) park was laid out in its present form in 1880. Landscaped with flowerbeds, trees, a fountain and a lake, the green is dotted with memorials to eminent Dubliners. The 1887 bandstand is still the focal point for free daytime concerts in summer. It is the best place to be for a summer lunch picnic. One of Dublin's largest and grandest Georgian squares. On three sides are Georgian Houses and on the other the garden of Leinster House, and two museums. Many of the houses predominantly used as office space - have plaques detailing the rich and famous who once lived in them. The attractive central park features colourful flower and shrub beds. Look out for the statue of Oscar Wilde reclining on the rock. Named after Sidney Herbert (1810-1861), the father of the Earl of Pembroke who, in 1903, offered the site to Pembroke Urban District Council for development as a public park. The famous Dublin International Trades Exhibition was held on the site in 1907, housing exhibits from the British Empire (including a complete Somalia village). Thereafter the lands were developed as a public park. The existing duck pond was constructed for the exhibition of 1907 to house the 'Canadian Waterchute', but little else remains of the original buildings. Taken over by Dublin Corporation in 1932 the 13 hectares (32 acres), are a fine example of how a relatively small park can provide a variety of amenities such as football, tennis, boules, croquet and children's play area, while at the same time fulfilling an important conversational role in the heart of the city. Recent developments in 2007 have been the addition of a new children's playground and an all weather multi use pitch. Is the southernmost of a pair of canals that connect Dublin, in the east of Ireland, with the River Shannon in the west, the two canals nearly encircling Dublin's inner city. Its sister canal on the Northside of Dublin is the Royal Canal. The last working cargo barge passed through the Grand Canal in 1960.The first part of the canal is very historic and picturesque as we approach the city centre it all turns into a modern scene. It is the best thing to stroll on the side of the canal especially on a Thursday when there is a farmers market near Baggot street bridge. My dearest place in Dublin Glasnevin. it is absolutely stunning every time of year but my favorite is autumn without a doubt. They have an exhibition of the produce grown in the vegetable garden ( million types of pumpkins).I am also a big fan of the Decorated pumpkin Competition held every year in the visitors' centre. The garden is also home to a herd of cheeky squirrels ( make sure you have some nuts handy). Established in 1705 by the Royal Dublin Society. These colourful gardens stretching over an area of 19.5 hectares, the garden area contains a large collection of plants including approximately 20,000 species. Notable features include herbaceous displays, rose garden, rockery, vegetable garden (I love this), arboretum, extensive shrub borders and wall plants.There are four ranges of glasshouses, including Richard Turner's architectural masterpiece, the Curvilinear Range. Also a newly restored Great Palm House. A new Education and Visitor Centre opened in September 2000. This includes a restaurant/tearoom, lecture theatre and exhibition area. Don't miss the Garden's Cafe it has the best cakes in town. Outside Dublin, but close enough for an afternoon excursion! You can get an even better sense of Ireland if you venture to the outskirts. Here’s a selection of places you can head for a morning or afternoon excursion, and feel like you’ve left the city altogether! Howth is a picturesque fishing village on a peninsula just north of Dublin City Centre with a beautiful pier, seals to feed in the harbor, and some of the freshest fish around. On a dry day, pack your sneakers or hiking boots, and take the cliff hike from Howth Village around the peninsula – a couple hours hiking, but one of the most beautiful views this side of the Atlantic. if you are lucky you will also meet the local seal herd.Don't miss the fresh fish and chips at Beshov's or if you look for a nicer seafood expedience Aqua restaurant. (Irish: Na Sceirí, meaning "(The Rocks") is a seaside town in North County Dublin, Ireland, now part of County Fingal. The name comes from the Norse word Skere which has descended into the Irish word ¨Na Sceiri¨ which means ¨The Rocks.The small town has windmills off the coast. 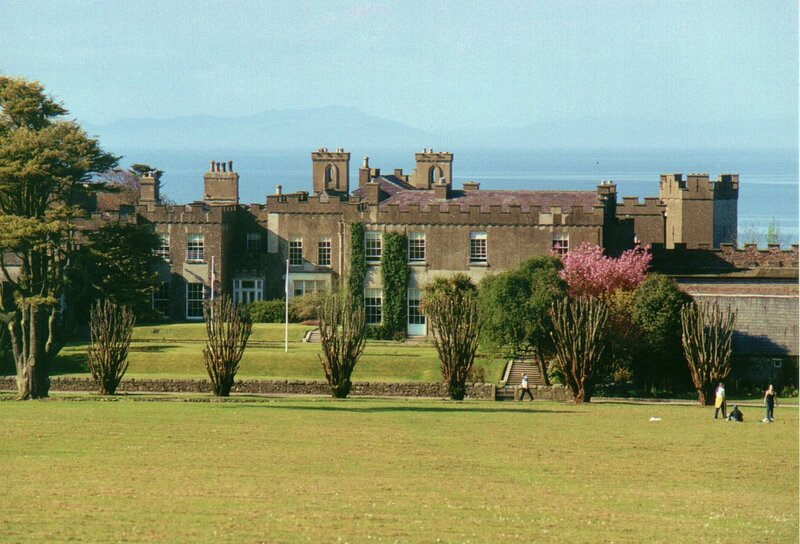 The other best place to visit is Ardgillan Castle a good hike but worth it. While you can get a quick fix of Ireland’s famed Avoca Handweavers just off Grafton Street, you’ll get the full Avoca treatment if you venture just 30 minutes south of the City Centre. Set on the old Jameson estate, Avoca Headquarters in Kilmacanogue offers two cafes, a food hall and deli, a nursery, and a retail space where you’ll find Avoca’s famous scarves, sweaters, and lots of traditional Irish home goods. Glendalough, in the Wicklow Mountains, is a gorgeous destination for hiking, fishing, walking and, for some intrepid visitors, swimming. Some trails will give you an incredible view of Dublin down below. There are two lakes in Glendalough, making it one of the most visited spots outside of Dublin. Malahide Castle, set on 250 acres of park on the seaside, was a private residence until 1975! Now you can tour the inside, see how a family decorated their castle, and then grab a bite in their gourmet café in the castle’s basement. A popular place for locals to stroll, you might even catch a glimpse of the peacocks that roam the grounds. Just a 30-minute bus ride from the City Centre on the Number 44 bus, Enniskerry is a quaint, small town at the base of the Wicklow Mountains. Check out Poppy cafe for the best quiche and pies. Get to Enniskerry and you’ve got lots of options for walks, hikes. From spring, enjoy the Powers court Waterfall and Gardens, or take one of the walks – try Lover’s Leap for a romantic hike. There is a lovely Avoca shop in the Powers court Estate beside exhibitions. 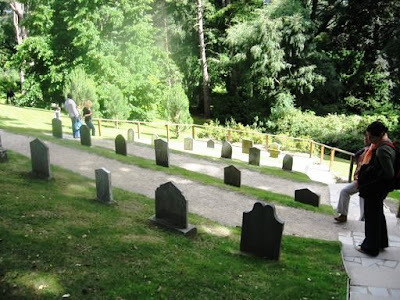 Don't miss the animal’s cemetery. (Irish: Bré, formerly Brí Chualann) is a town in north County Wicklow, Ireland. It is a busy urban centre and seaside resort, with a population of 31,901 making it the fourth largest in Ireland .It is situated about 20 km south of Dublin on the east coast. The town is the location of some industry, is home for many who commute to Dublin by car or DART, is a shopping town for the surrounding area and still attracts tourists particularly from Dublin at weekends. The town straddles the Dublin-Wicklow border, with a portion of the northern suburbs situated in County Dublin. Bray is home to Ireland's only dedicated film studios, Ardmore Studios where films such as Excalibur, Braveheart, and Breakfast on Pluto have been shot. (Irish: Na Clocha Liatha) is a coastal town and small seaside resort in County Wicklow, Ireland. It is located on Ireland’s east coast, 8 km (5.0 mi) south of Bray and 27 km (17 mi) south of Dublin (it is within the Greater Dublin Area), with a population in the region of 15,000. The town’s name is derived from a one kilometer stretch of coastal grey rocks situated between two beaches; this rocky area is known as the sea front. Don't miss the cliff walk from Bray to Greystones.The harbour area and the railway station are at the northern and southern ends respectively. The North Beach, which begins at the harbour, is a stony beach and some of its length is overlooked by the southern cliffs of Bray Head, which are subject to erosion. The South Beach is a broad expansive sandy beach about one kilometer long. It is a Blue Flag beach and receives many visitors and tourists, mainly in the summer. The town is bordered by the Irish Sea to the east, Bray Head to the north and the Wicklow Mountains to the west. A town on the east coast of Ireland, about seven miles (11km) south of the capital Dublin.Historically Dún Laoghaire has always been a 'Gateway to Ireland', Dún Laoghaire gets its name from the Irish translation Fort (Dún) of Laoghaire. It was once the seat of King Laoghaire, the ancient High King of Ireland before the Vikings sailed from Scandinavia and established themselves in Dublin. A town with a rich and complex heritage, often referred to as 'Dublin's Riviera' due to the spectacular landscape. Dun Laoire, offers the best of local businesses, cafes and artisan shops. When we’re talking about food in Dublin, you’ll find tons of variety. Many of restaurants around Dublin do great early bird of pre-theater meals with a remarkable number of choices. Here are my favorites as well as a whole bunch more! Bleu bistro is located in the heart of St Stephens Green / Dawson St Area offers superb seasonal French bistro style food with an emphasis on Quality and Value. Bleu is ideal for either lunch or dinner. The innovative menu takes a modern style bistro approach to French cuisine with an occasional nod to the French classics. It has its own small farm in kilternan where they grow & supply the restaurant with organic salad leaves herbs and vegetables as much as possible. The Wild Goose Grill offers classic bistro food in stylish and comfortable surroundings. The wine list is comprehensive with nearly three hundred bottles to choose from (Hungarian wine is also being served). The Wild Goose Grill takes its name from the Wild Geese, those successive waves of Irishmen who left their country to serve in the armies of continental Europe during the sixteenth, seventeenth and eighteenth centuries. The Wild Geese scattered far and wide, distinguishing themselves on battlefields from France and Spain to South America. Originating in 1938, the Unicorn Restaurant has been running under the present management and ownership of the ever charismatic Giorgio Casari for 16 years. The Unicorn owes its success to his attention to detail in the many Italian influenced European dishes that are on offer. The Unicorn’s warm, modern and informal environment have stood the test of time where diners come to soak up the ambience and enjoy the live music and relaxed atmosphere with their meal. The Unicorn menu still consists of the favourite dishes that it has always had on offer like, Dublin Bay Prawns Provencale and our secret receipe Calamari Fritti as well as many new seasonal flavours brought on board by Award Winning Executive Chef Lorcan Cribben. Dublin’s Original Mexican Grill in Wexford Street. They serve the Ultimate Burrito by using the finest, freshest ingredients, all prepared and marinated in house daily, using our very own recipes. “Simple, Honest Food, 100% Fresh". Carluccio’s caffè provides great quality, authentic Italian food at sensible prices. A memorable experience in a happy bustling environment located on the corner of Dawson St. and Duke St. in the heart of Dublin's most fashionable shopping area. Open throughout the day for breakfast, morning coffee, lunch, a shopping pit stop or a three-course meal with wine in the evening, the striking 170-cover caffé is spread over two floors with al fresco seating. With locations around Dublin, Butlers Chocolate Cafes are a perfect spot to stop in and warm up with a cup of their decadent hot chocolate – made with fresh Irish milk and their homemade chocolate fudge sauce. Great cheap and cheerful deals on any hot drink and a muffin or scone (€3.50) or any hot drink and a sandwich (€5) and they’ll grill them for you – yum! Poppies Café – The Square, Enniskerry, Co. WicklowTraditional, Irish home cooking. Try the Beef in Guinness Pie – very authentic. For something sweet, try the rhubarb crumble. Afternoon Tea has been and will always be a lovely Irish tradition. You’ll find it at most hotels around the country, but here are a few to try. With four restaurants and lounges, the Shelbourne is a place Dubliners like to see and be seen. Stop into their lobby lounge for tea and a biscuit, and a little people watching. Last time I was there, I saw President Clinton and his Secret Service entourage. Donnybrook Fair a family run business provides a friendly & personal service the local communities and surrounding areas. DF focuses on bringing customers the best quality food and service. Fresh food sourced from the best of local suppliers is prepared daily to deliver an extensive range of fresh homemade products to customers. Speciality foods from the best Irish artisan produces and international suppliers are brought together in the stores. Grafton Street is Dublin’s high street, with all the major chain stores. A/Wear, River Island, H&M, Topshop are all on or near Grafton Street. It’s a pedestrian street where you’ll find buskers (street performers) nearly every day of the week. You’ll also find cute boutiques and big flower stalls in addition to the big name stores. Brown Thomas is one of Dublin’s luxury department stores – started in 1849, you’re still greeted by a man in a waistcoat and top hat! Brown Thomas houses designer brands like Chanel and Cartier. 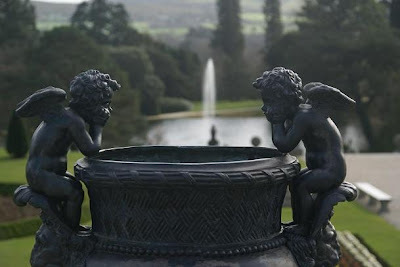 Powerscourt houses over 40 shops from antiques to art to clothing and home furnishings. You could spend hours wandering through the old stone building set just a few blocks from Grafton Street. Check out Article, just opened in 2010, it has beautiful tableware, prints and other home accessories. Also make sure to check out Rubanesque for ribbons and other trimmings, as well as The Loft, on the top floor of the Powerscourt Centre, full of vintage clothing and jewelry. Fave bookshop in Dublin - there's just something so book loving about it! The selection is quite broad - from bestsellers to Irish interest to specialist and academic books. They also have the lovely bargain basement and frequently do sales of interesting books. I think what I like best about it is how much the staff love books... They also have stuff recommendation cards at a variety of the books.They also have some comfortable couches and armchairs. Weir's is a little treasure trove it feels like the kind of place you could expect to be greeted by your first name when you step in the front door . It has anything you need when it comes to home ware or hardware. They stock: cards, kids toys, frames, candles, chopping boards, cutlery, baking trays, light bulbs, mugs, baskets and lots more. Housed on two floors Chapters sells an extensive range of books, music and DVDs, both new and second hand, as well as thousands of bargain priced titles. Previously owned books, CDs and DVDs can be bought and sold in our second hand department, and we offer cash or store credit. Dart – The Dart is Dublin’s version of a subway, but above ground and more like a commuter train. There are stations across the city, but it primarily runs north to south. Luas – If you can’t get where you’re going on the Dart, look at the Luas lines. The Luas is Dublin’s tram line that runs inland through the city and out to some of the surrounding neighborhoods. Bus Eireann – Bus Eireann is Ireland’s version of Greyhound and has extensive lines throughout the country. It can easily get you out to Trim or even out into some very rural areas. Taxis – There’s no shortage of taxis throughout the city and if you can manage, try to get an Irish taxi driver who can give you the commentary and tour as you’re making your way to your destination. Rental Bicycles – You’ll find the Dublin rental bicycles all around the city and they’re great value. Pay €10 for a year’s membership, or simply buy a 3-day pass for just €2. Just make sure you remember to cycle on the opposite side of the road! Bed and Breakfast – To get a feel for what it’s like to really live in Dublin, I’d try staying at a bed and breakfast; most are located in the suburb neighbourhoods only a few minutes train or bus from the City Centre. And make sure you take the full Irish breakfast at least one of the mornings – rashers, black and white pudding, sausages, eggs, toast and grilled tomatoes – but don’t go looking for pancakes and French toast, you won’t find any! There’s no use in trying to predict the Irish weather. It could be sunny and clear any time of the year, and it could be raining cats and dogs at any time of the year. As a general rule, in the summer, it’s milder. And in the winter, it can be raw and cold. No matter the season, your best bet is lots of layers and shoes that does not get wet easily or wellies. Of course, don’t forget a rainproof jacket and a wind proof umbrella, just in case.